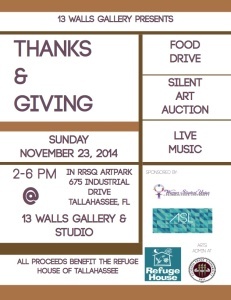 On Sunday, November 23rd, 2014, the Fall 2014 Intro to Arts Administration class will be hosting the Thanks & Giving Fundraiser from 2:00 – 6:00 p.m. at the Walls Gallery in Railroad Square. Proceeds will benefit the Refuge House of Tallahassee, an organization serving people affected by domestic violence and sexual assault. The fundraiser itself will be funded by an Academic Engagement and Innovation grant applied for and awarded to the Introduction to Arts Administration class taught by Samuel Rosenstein as part of their educational experience this semester. The grant was requested to fund a project/product-oriented, service-learning or community-based learning venture, and the class elected to create and organize a fundraiser. The assignment is designed to provide students with a hands-on art administration experience. Introduction to Arts Administration (ARE 4930) is a seminar style course aiming to introduce students to arts administration. The course features a number of on-site field trips as well as a service learning project which fosters community engagement and provides a valuable opportunity for students to gain real-world experience in the field of arts administration/ arts management. In Spring 2015, the class will apply for another grant to engage in another community based project. Funding will help facilitate the continued community partnership with Nefetari’s, a local restaurant and entertainment space. Students will work in collaboration with the staff to develop and implement a small scale exhibit/performance in line with Nefetari’s mission and the student’s vision. At the end of the semester, the class will make a presentation documenting their experience at all stages of the process. 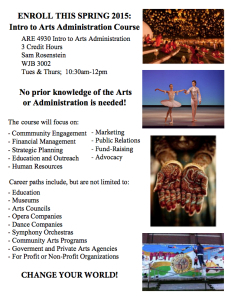 Introduction to Arts Administration is an excellent opportunity to get your feet wet in the world of arts administration. Spring enrollment is open. We hope to see you all at the upcoming fundraiser! For more information, visit Arts Administration.